2010 heralded a major change with the introduction of a new charter vessel, an ocean going all weather, deep sea, ice breaking, salvage tug named the Baltic Warrior. The vessel, built by Schichau Unterweser in Bremerhaven, Germany in 1964 was designed and built to withstand some of the worst seas in the world - the Northern Baltic Sea, the Arctic Ocean and the Barents Sea for for up to three months at a time. 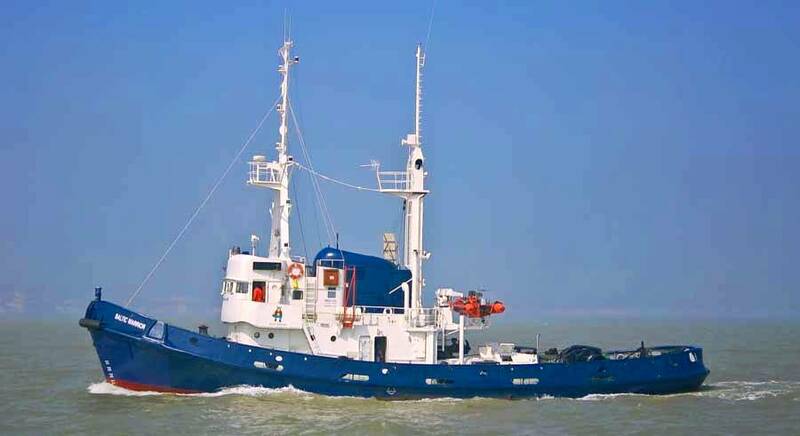 Owned and operated by Tieco Ltd, trading as Marine Towing Solutions Limited, Baltic Warrior is a fully operational tug with an International Load Line Certificate, a British Captain and fully qualified permanent crew. 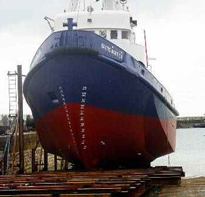 The vessel carries a full complement of safety equipment and has an impressive technical specification which matches that required for a sea going, commercial vessel. Although built in in 1964 by Schichay GMBH Bremerhaven (Germ Lloyd +100 A4, K E+), she underwent extensive refitting and was re - engined in 1977 (Bureau Veritas +100A4 M E2 Tug + MC E1) to exacting standards. The tug is almost the same physical size of the previous charter vessel although it has to be said completely different breeds of work horse. Whilst the Ocean Dancer might have more appeal to shipping enthusiasts the tug is undoubtedly equipped for the charter. The electronic wheelhouse equipment can be supplemented to depending on specific charters. In her present role looking for the location of the Bonhomme Richard remains, the vessel is equipped with sophisticated side scan sonar equipment. The safety / standby RIB on its dedicated cradle by the hydraulic crane. With five on board generators, there is unlikely to be any shortage of electrical power. She was first owned by Bugsier Reederei und Bergungs AG and was called Bugsier 26. In 1977 , she was acquired by J Johanssen and Sohn and renamed Axel. Eleven years later she became Baltic Stevns when she was acquired by Nordane Shipping. Tieco Marine bought her in 2002 when she was renamed Baltic Warrior. 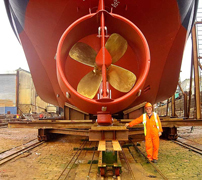 The images below present the tug during one of her overhaul periods, the man giving some sense of scale to the size of the hull and its huge propeller. Eamon Guerrini the Captain and owner of the Baltic Warrior and is an engineer and an Ocean Yacht master. 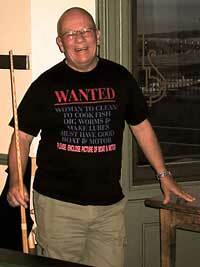 He spent thirteen years in the armed forces and has over twenty years experience at sea. He also spent over four years as a technical studies teacher and house parent in a GLC boarding school for students with learning disabilities. He has also been a professional DJ and company director of a sound company and has had the privilege of working with many fine artists. Eamon is seemingly a multi skilled individual, fluent in Thai, and by all sounds of it a mean pool player - just ask Bob (Seletar). On the 26th June my wife and I met with Eamon and his wife Duan at a local hotel here in Whitby. Eamon had arranged to stay overnight as he was expecting to change the crew on the ship, however the change took place in Grimsby. Eamon chose to come up to Whitby to see for himself the harbour the ship would be working from and experience Whitby for himself. We had been exchanging e-mails for short while and agreed to meet up for a drink and a chat. We met during the early afternoon and found we shared common interests, he had found diving enchanting and although his was predominantly in warmer climates he could appreciate how much I missed diving. As the afternoon progressed found the meeting thoroughly enjoyable, and we happily decided to accompany Eamon and Duan to Harry's Bar, a local restaurant where our son is the chef. We finished the evening off by escorting Eamon along to the harbour, where my wife managed to capture the photograph to the right. Eamon found Whitby larger than he had expected and was satisfied that his ship would fare well here. He is hoping to get back up later during the expedition and we look forward to meeting him and Duan, so that we can return the favour and grace he shared with us. The other gallery pages for the Tug and its visits here in Whitby can be viewed fromthis link.